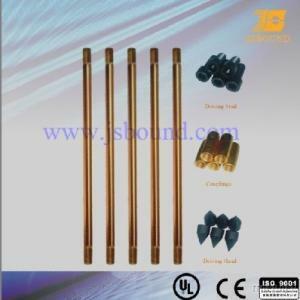 Copper-clad steel grounding rod has been widely used as composite conductor. It is a kind of bimetal composite material manufactured using a unique technology(molecularly boding pure electrolytic copper onto low carbon high tensile steel cores). Therefore it can resist corrosion better and can be easily driven to great depths. 1 Resist corrosion better than galvanized rods. It has at least 30 years service life. 2 Unique manufacturing process ensures uniform plating thickness. 3 Reliable: the product is applicable in various soil moisture, temperature, PH value and varying earth resistivity construction condition. 4 Easy installation and low construction cost. 5 The special way of connecting adopted can deep-drive the rods up to 35 meters underground to meet low-resistance requirements in special occasions. 6 Much cheaper than traditional way of using pure copper ground electrode.